One night, a tower of light pierces through the sky from the roof of Shinyo Academy. For a moment, silence, as every piece of electronics in the city shuts down, and then reboots. Across the city, many people witness this strange phenomenon. Their lives, and the city itself, have been changed forever. This is the opening scene of Boogiepop Phantom. 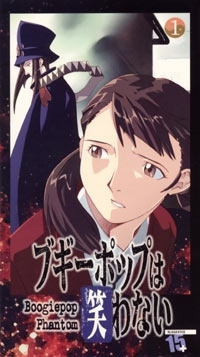 Over the course of the series, it tracks the actions of "Boogiepop Phantom" and "Manticore", ghosts created by the light in the opening scene. High school students are "evolving" and becoming higher forms of humanity. They are being kidnapped by unknown assailants, and people are starting to wonder. Is Boogiepop back? The death god that kidnapped students a little while ago, and took them away, never to be seen again. Boogiepop, his phantom, the Manticore, and the young vigilante Nagi Kirima clash as the students' stories intertwine, and Nagi seeks to uncover the mystery of Boogiepop Phantom. If Boogiepop Phantom is your first foray into the Boogiepop series, (and for many it is) be prepared for something thoroughly confusing. The opening scene of the beam of light seems so random and unrelated that many viewers will be turned off from the series after the first episode. However, those who stick with Boogiepop for the first three episodes will find something truly worth their time. The first failure of Boogiepop Phantom is it's weak first episode. While it has its creepy moments, they are very subtle scenes, such as when you realize that a certain character is afflicted with a mental disorder and the reasons for it. It also falls too much into teen drama at times, focusing on the relationship between a girl Moto and the now-missing Saotome. Finally, the first episode fails to do what certain shows of it's genre, Paranoia Agent in particular, have done very well. It does not start with something tangible and easy to understand, break it down over the course of the series, then build it back up at the end. (as with the concept of Lil' Slugger at the beginning of PA) Instead, the first episode sends you blasts of seemingly unrelated material that may seem significant after multiple viewings, but seem like bad direction for the first-time viewer. In short, it fails to hook you. The plot is just what fans of the psychological horror/mystery genre will enjoy. High school students are disappearing, and no one really knows how or why. Each episode focuses on a different character (usually a high school student) and their descent into near-madness. As you may have guessed, there is usually an "attack" of some sort on this stressed person, but luckily it is not as formulaic as Paranoia Agent's "person goes crazy, Lil' Slugger hits them with bat." (sorry about all of the references to PA, but with the shows having such similar premises, comparisons are inevitable) The character-by-character method of revealing the plot works very well in this case, and serves to slowly highlight the message of the series without having to spell it out. Viewers will delight both in the startling and oftern disturbing twists in each episode. Also, the characters are all connected, in a web that will induce many "ohhh"s from a viewer. Animation is slightly dated, and does not stand out very much. The character art is rather bland, causing the viewer to have to backtrack and look at many of the characters (mostly schoolgirls) to figure out who's who. However, the animation in general is smooth and precise, with lots of grays and similar "urban" colors saturating the screen to give a dark and unsettling feeling. The dub shines in these DVDs, showing how sometimes the most overlooked dub tracks can be the most accurate. I watched the entire series with both the dubbed voices and the subtitles scrolling on the bottom. In almost every scene, the dub was better written than the sub, and the actors performed their lines naturally. On a much smaller note, the next episode sequences feature creepy overlayed whispers that do not include subtitles, so the English version gets the point across better. Sound is another noticeable portion of the anime. Along with the diverse and often disturbing musical track, (made up of strange techno beats and instruments) there is a persistent tone that is repeated to amazing effect. At the start of every episode, and at many times in between, the viewer will hear a the same note played. It is driven into your head until it becomes a symbol of its own, and you know there is something important and usually psychological going on when you hear it. The Boogiepop Phantom box set is a very good investment for fans of the psychological horror and mystery genres. The set comes with the 12-episode series (with some cool music videos and such inside) and the live action film Boogiepop and Others. Together, "Phantom" and "Others" explain missing information, and Boogiepop Phantom is nearly impossible to fully understand without watching "Others." (Though I suggest watching Phantom first, since Boogiepop's identity will be a mystery until the end if you do, while his identity is given away in Others) This show is confusing, but with that comes the ability to truly make you think. It will leave you pondering its profound message about memories, change, and humanity itself.